Villa Iris is a newly constructed stylish villa laying claim to an extremely privileged position close to the centre of Nerja. This contemporary jewel lies in the foothills of Andalucía on the outskirts of the pretty village of Nerja. Brilliant white exterior with slate grey brickwork stands out against a natural backdrop. Cleverly designed in an elevated position, it affords beautiful panoramic views of the coastline. An aqua hued swimming pool hugs the front of the property and is perfect for morning laps. Bright poolside lounges and a modern, white outdoor dining table feature too. If you hire a car to explore, there is ample parking in a private bay under the villa. One of the luxury highlights of Villa Iris is the huge indoor Jacuzzi, which features a flat screen TV, built into the wall. Surrounded by crimson and cream mosaic tiles, it’s a chic addition to an already stunning property. There are several areas to chill, with modern sofas and also an indoor dining table for six. We loved the contemporary touches in the bedrooms, such as the Japanese style sliding wardrobe doors and the brilliant white blinds. A stroll into the centre of Nerja takes just under half an hour. Part of Spain’s Costa Del Sol, Nerja has maintained its’ authenticity, with narrow cobbled streets and whitewashed houses. The area boasts sixteen kilometres of golden beaches and fantastic water sports such as Scuba diving and sailing. The pool area was wonderful, and we enjoyed the privacy. The villa has a great view over Nerja and the sea, and is a five minute drive from Burrianna beach, and all the shops you could need. 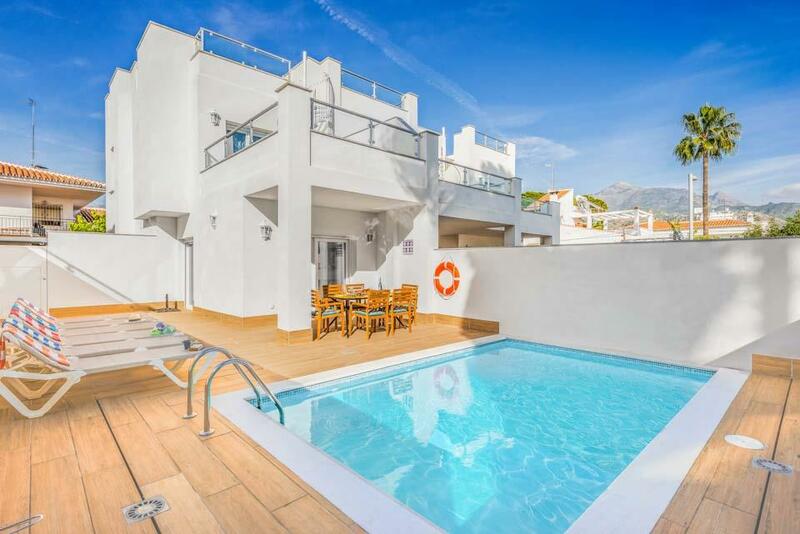 The villa is finished to a very high standard and it's facilities are excellent. The views from the pool are amazing and we will definitely return! A beautiful clean Villa with fantastic facilities and a great view. Nerja is a lovely Spanish seaside town - its touristy but still retains a Spanish feel to it, has lots of great restaurants and isnt too spoilt. Beaches are great for the kids. Villa Iris is situated a bit out of the town so is quiet and has the advantage of being much bigger and more modern than many of the villas in the town. Its great to have an indoor pool as well and there was tons of space and storage. Size of the villa is good the view of Nerja is beautiful. The villa was very well equipt, clean and beautifully decorated and furnished. Loved the very well presented Villa that was away from the crowded areas. The resort was very good when we visited and had much to offer. FABULOUS MODERN VILLA Villa Iris is a new fabulous modern villa and we have no real complaints. The villa is very modern and furnished well. There is plenty of space both inside and outside the villa. The pool deck is very spacious with six good quality loungers, there is also an outside dining table with six chairs which is situated under an awning which can be opened and closed depending on whether you want shade or not - very useful. The 'indoor pool' is a nice touch but we thought it wasn't heated enough to want to lounge around in it for very long, if it was heated more we would have made more use of it. The kitchen is well equipped but missing just a few small minor items such as a decent coffee pot (cafetiere), potato peeler, a chopping board, etc.., however this is a small point and as this is a new villa we dare say the owners will correct this as time goes by. The three bathrooms are all modern and very well appointed - two shower rooms and one bathroom with bath, good water pressure and plenty of hot water. The outdoor pool is wonderful, it is big with a maximum depth is 1.6M, but it is not heated and this was a problem, we were there in May the weather was wonderful but the pool was much too cold, we feel not installing pool heating is a mistake, we like to swim but we only used it twice during out 10 day stay and this did somewhat spoil the enjoyment. The villa is very secure with shutters and/or grilles on most windows, the villa is walled in on all sides, access is through a lockable gate with a video entry system. 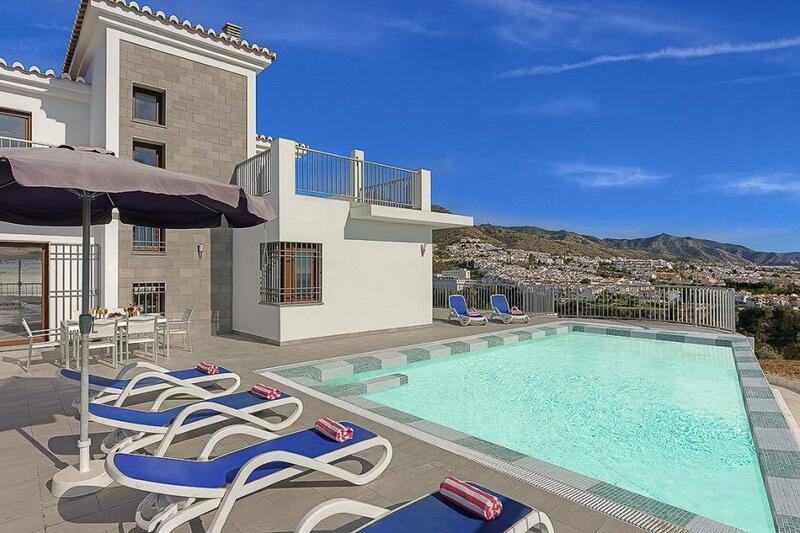 The villa is set on a hillside above Nerja, the view is wonderful looking down on the town and sea. The access road up to the villa is one track and more than a bit rough. When we first arrived we wondered how we would manage in the dark, however you do get used to it and it is not a real problem we managed perfectly well in our hired Ford Focus. Luckily we never met anyone going the opposite way to us as passing on most of the track would be difficult. 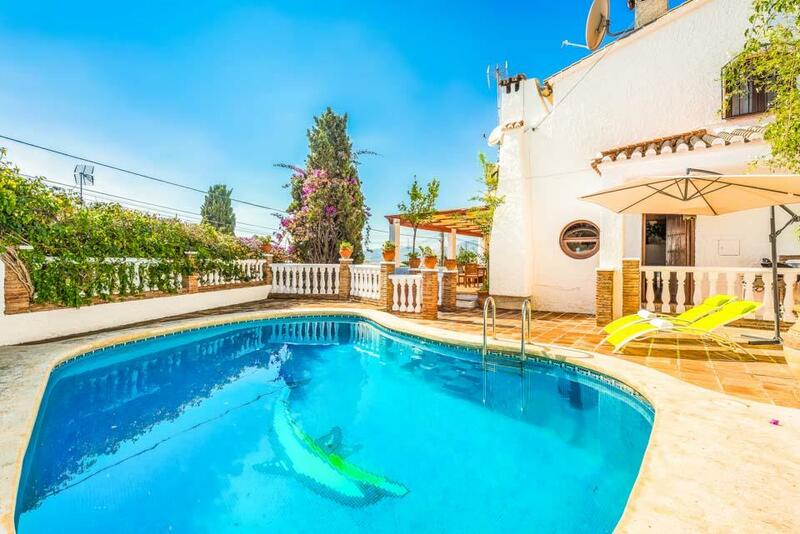 We would not hesitate in recommending this villa to anyone, however we feel we must point out that there is an unguarded drop of approximately 2M off the far side of the outdoor pool which may be dangerous for young children. We had a fabulous holiday the villa, the weather and Nerja were all wonderful. Large spacious clean with super swimming pool. Very private and secure. Rated: Excellent. Villa perfect, once we found it!